It is a turbulent time of rising hostili­ties on the Korean peninsula. The 70-year division between the Korean people is one of the most tragic in history. The war remains unresolved between North Korea, the U.S. and South Korea, and little progress has been made toward a new future. 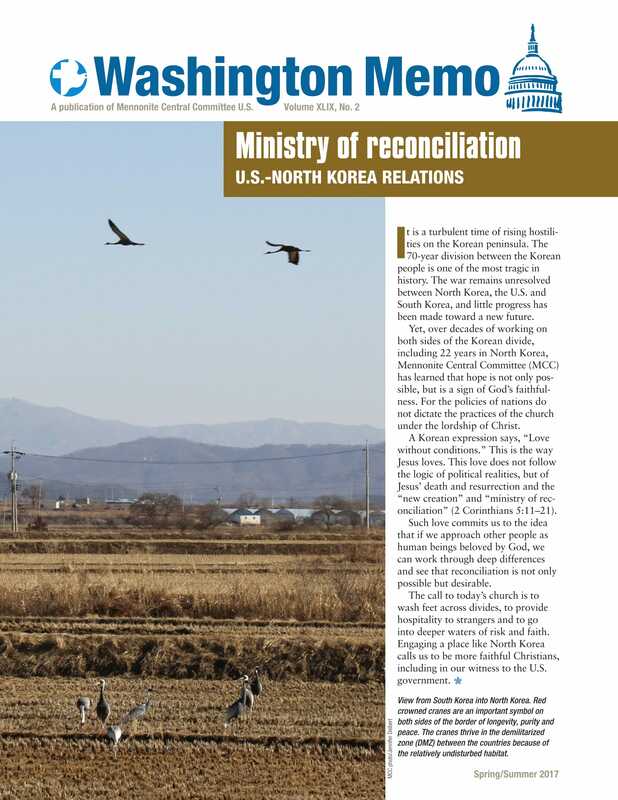 Yet, over decades of working on both sides of the Korean divide, including 22 years in North Korea, Mennonite Central Committee (MCC) has learned that hope is not only possible, but is a sign of God’s faithfulness. For the policies of nations do not dictate the practices of the church under the lordship of Christ. Read the full issue of the Spring/Summer newsletter online. Climate change: On June 1, President Trump announced the U.S. will withdraw from the Paris climate accord. The administration had already halted federal government efforts to reduce U.S. greenhouse gas emissions and ended funding for the Green Climate Fund. Only two countries have not signed the accord, Nicaragua and Syria (Nicaragua because officials there believed the agreement did not go far enough). Criminal justice: On May 10, Attorney General Jeff Sessions sent a memo to his federal prosecutors directing them to pursue harsh and lengthy sentences for low-level drug offenses. This new policy overturns the practices of former Attorney General Eric Holder. Immigration: Temporary Protected Status for Haitians in the U.S. has been extended for 6 months but with no guarantee it will be extended further. A federal appeals court upheld the injunction against President Trump’s travel ban for 6 majority-Muslim countries. Congress is debating a number of immigration enforcement bills. Read more about these and other issues in the May 26 immigration update: English | Spanish. Palestine and Israel: Today (June 5) marks 50 years of Israeli military occupation of East Jerusalem, the West Bank and Gaza. On President Trump’s recent trip, he met with Israeli Prime Minister Netanyahu and Palestinian President Abbas, but it is unclear whether a peace process will start up again. On June 1, Trump delayed a decision on moving the U.S. embassy from Tel Aviv to Jerusalem for at least six months. June 8, 1-2 p.m. EDT, PJSN webinar: What can your church do to help immigrants? Sponsored by the Peace and Justice Support Network of Mennonite Church USA, Mennonite Mission Network and Mennonite Central Committee U.S.
July 4-8:Mennonite Church USA convention, Orlando, Fla. – MCC Washington staff will lead workshops on Palestine and Israel, Syria, immigration and criminal justice. May 26 MCC immigration update: English | Spanish. Today we welcome our two summer interns, Julian Brubaker from Lancaster, Pa. and Daniel Friesen from Fresno, Calif. Julian is a student at Amherst College and Daniel is an Eastern Mennonite University graduate who served with MCC’s Serving and Learning Together program in Vietnam.